The Digital Library of the Commons defines ‘commons’ as “a general term for shared resources in which each stakeholder has an equal interest”. The idea behind the Commons cloud credits business model is to provide unified access to a choice of “Commons-conformant” compute resources. This cloud credits model will offer individual investigators a choice of cloud providers so that the investigators themselves can select the best value for their individual research needs. Cloud computing is increasingly being used as a computing platform by researchers because it affords a high degree of scalability and flexibility in both cost and configuration of compute services. Making public data, especially large commonly used data sets, easily accessible in the cloud will reduce the burden of cost for storing, moving and processing these data sets. can be used with the cloud provider of the investigator’s choice. 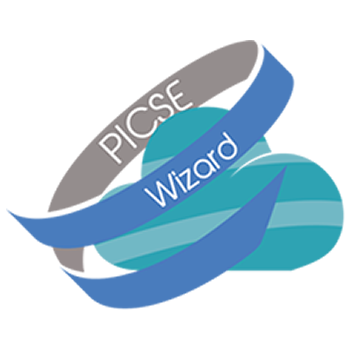 The involvement of multiple cloud providers will empower investigators by creating a competitive marketplace where researchers are incentivised to use their credits efficiently and cloud providers are incentivised to provide better services at the lowest possible price. 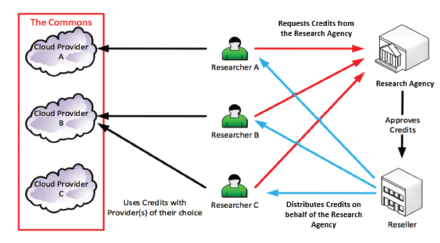 In the pilot NIH would not directly distribute credits; rather, it will contract with a third party to manage the requests for and distribution of credits (shown as the ‘Reseller’ in the cloud credits business model, Figure 1, below). In order to participate in the Commons, a cloud provider must make its computing environment ‘conformant’, ensuring that it meets a set of standards for capacity (storage, compute, and network) and capabilities that enable scientists to work in such an environment. One potential down-side of this innovative pay as you go model is persistence i.e. digital objects may no longer remain in the Commons if the research agency does not continue to pay for their maintenance. In addition, investigators have an unprecedented level of control over what lives (or dies) in the Commons.